While the Obama administration was creating jobs, the Republicans were pushing legislation that undermined green jobs. During the first 2012 presidential debate, Republican nominee Mitt Romney continued the GOP’s assault on green jobs. The proliferation of green job sites demonstrates just how fast this sector of the economy is growing. The US department of Labor’s Career One Stop is a leading green jobs site. EcoEmploy.com is an example of a private green jobs search site. Other green jobs sites are more local like Green Guru’s employment listings, which serve Westchester and the Hudson Valley. Sites like these provide listings for thousands of positions in hundreds of green careers. There are a wide range of green jobs including those associated with energy efficiency, renewable energy, pollution reduction, and recycling. A report titled “More Jobs, Less Pollution: Growing the Recycling Economy in the U.S.,” claims that recycling alone could create 1.5 million American jobs. The Beyond.com Career Trend Analysis Report reviewed thousands of top-tier industry and local career sites and singled out green industry as being one of the fastest growing sectors. According to the report, green consultants are amongst the fastest growing jobs, as are eco-friendly freelance writers. Green jobs can also be found in agriculture, building, finance, forestry, manufacturing, retail, and transportation. Some of the sectors with the highest demand for green jobs are venture capital (VC) firms, utilities and environmental services. These sectors provide employment in a wide range of green positions including analysts, auditors, certifiers, economists, energy experts, engineers, investor relations, financial professionals, fund managers, lawyers, marketers, pricing specialists, researchers, scientists, and technical professionals. Led by wind and solar, the renewable energy sectors are major providers of jobs. The solar power industry is one of the largest national employers of US green industries. The Solar Energy Industries Association predicts an increase of over 110,000 US jobs by 2016 in the solar industry. Employment as a solar power installer is a good position that can provide remuneration equivalent to a management position (up to US$40.00 an hour). There are a host of solar jobs available from solar technology companies, utilities companies, engineering firms, government departments and industrial product distributors. Other solar related jobs include positions in procurement, sales, and drafting. The truth is that clean air safeguards have created jobs. This was in evidence long before President Obama was elected to the Oval Office. According to a speech delivered by the U.S. Environmental Protection Agency head Lisa P. Jackson, implementing CAIR Phase I, has created an estimated 200,000 American jobs in the air pollution control industry since 2003. As of 2008, the environmental technology sector has generated more than 1.7 million American jobs. In 2010, the top 10 utilities had a combined $28.4 billion in profits and $7.5 billion in cash balances. Utility companies are doing well, by their own admission they are prepared to protect their customers and they have the capacity to do so. “…no one should believe the claims of either the Republican leadership or the energy companies, with respect to the project being shovel ready or with respect to the number of jobs it’s going to produce,” he said. The Keystone XL will not produce the number of jobs extolled by Republicans. Most believe that the pipeline would be lucky to create half of the 20,000 American jobs promised by Republicans. According to a Berkeley study, investing in renewable energy produces more American jobs than a comparable investment in the fossil fuel energy sources. The study was conducted by Daniel Kammen, a professor in UC Berkeley’s Energy & Resources Group and Goldman School of Public Policy, and head of UC Berkeley’s Renewable and Appropriate Energy Laboratory (RAEL). He directed a team that reviewed 13 previous reports that looked at the economic and employment impacts of the clean energy industry in the U.S. and Europe. Since President Obama took office, the number of green jobs in America has grown every year. In 2008, the U.S. Conference of Mayors reported that there were 750,000 green jobs, in 2009, the PEW Charitable Trust reported that there were 770,000 jobs, in 2010, Oxfam America reported that there were 2 million green jobs and in 2011, the Brookings Institution reported that there were 2.7 million green jobs. 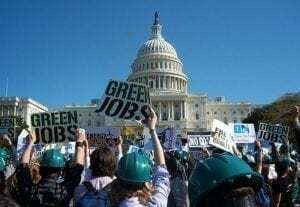 The GOP’s dim view of green jobs is squarely refuted by the facts. The numbers do not lie, even if Republicans want to infer that they do. Green jobs are the brightest part of an otherwise gloomy economy.